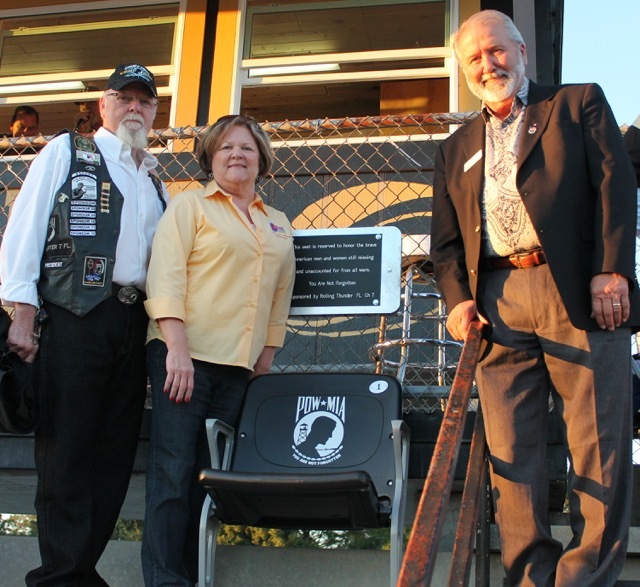 Rolling Thunder Florida Chapter 7 presented a POW/MIA Stadium chair to Citrus High School on Friday, October 31, 2014 at their Homecoming football game. Photo courtesy of Chris Gangler. In the photo are left to right, Archie Gooding, President of Rolling Thunder Florida Chapter 7, Sam Himmel, Superintendent of Schools for the Citrus County School District, and Bob Plaisted, Mayor, City of Inverness, FL. Members of Rolling Thunder Florida Chapter 7 applaud Friday night in Inverness after Citrus County Superintendent of Schools Sam Himmel and Inverness Mayor Bob Plaisted unveiled a POW/MIA Honor Chair before the Citrus homecoming football game. Read more. Be sure to visit the Citrus County School District Facebook page for photos and comments. You can locate the photos from the dedication by doing a "find" for November 1. Rolling Thunder Florida Chapter 7 presented a POW/MIA chair to Citrus County Board of County Commissioners (BOCC) on Tuesday October 14, 2014. The chair will be permanently and prominently displayed so all attending BOCC meetings will be reminded that there are still over 83,000 POW/MIAs from all wars. The POW/MIA Chair of Honor Program chairs are presented by Hussey Seating Company. They are proud to partner with Rolling Thunder®, Inc. to supply both portable chairs and fixed chairs. The Rolling Thunder®, Inc. POW/MIA Chair of Honor Program is intended to support Rolling Thunder's main mission by bringing daily reminders of the POW/MIA issue to cities and towns big and small across the nation. A POW/MIA chair in any location is to remain perpetually empty to help people remember that even though our soldiers are not here, there is still a space for them. 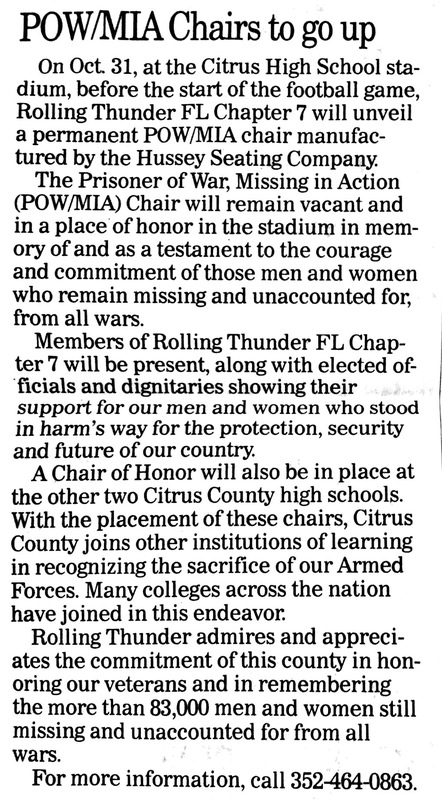 The Citrus County chapter of Rolling Thunder Florida is sticking with its mission statement: To educate the public that more than 83,000 Americans from all wars were left behind either as Prisoners of War/Missing in Action. And that the group would not rest until they are all back home. Members of Chapter 7, Rolling Thunder Florida (Citrus County) present the National Chair of Honor to the Citrus County Commission in honor of POW's and MIA's. The chair, also known as the "National Chair of Honor" is now displayed in front of the elevated dais on which commissioners conduct commission business. Read more. The Citrus County chapter of Rolling Thunder, Florida, presented a POW/MIA remembrance chair to the Citrus County Commission. Go to Past Meetings. Locate October 14, 2014 1pm Board of County Commissioners - Regular Meeting. Click on "Video".